Women across the political perspective applauded recently when Kay Coles James, the first woman and the first African-American to lead the conservative and respected Heritage Foundation, was chosen to join Google’s new external advisory council to in part discuss the ethics of Artificial Intelligence (AI). Our joy lasted barely a week when, in reaction to internal pressure from incensed employees, she was ousted via the dissolution of the council. As shocking as this may be, it is illustrative of the culture at Google, where over 1,000 Google employees took the time to sign a petition calling for James’ removal. Leaked email exchanges reported by Breitbart News show employees accused her of “transphobia” and “homophobia.” They accused her of viewing the LGBT community as “subhuman” and in support of “exterminationist” views. Concerned Women for America (CWA) has always fought to protect life from its beginning at conception until natural death. A recent hospital stay and subsequent medical care for my 80-year-old mother has served as a wakeup call to the particular vulnerability of the elderly. Click here to read the rest of this op-ed as featured on FoxNews.com. Likely incoming House Speaker Nancy Pelosi meets with President Trump this morning and issues such as immigration and infrastructure, among others will be up for discussion. But when she takes the gavel next month there will be only one priority for her, and if she whiffs on it her speakership will lose authority and credibility for the rest of her term. Literally a year ago — as the #MeToo era was erupting — the nation was waking up to news that a secret congressional “hush fund” had been used by Members of Congress to pay off accusers of sexual misconduct. Taxpayer money — yours and mine — was used to pay off these alleged victims. Many members of Congress, in both parties, pontificated and expressed outrage. Congressman Ron DeSantis, R-Fla., introduced a bill that called for publicizing the names of those who used the hush fund to pay for these so-called “settlements.” Many in both parties co-sponsored his bill but it went nowhere and now DeSantis is gone, about to become the next governor of Florida. 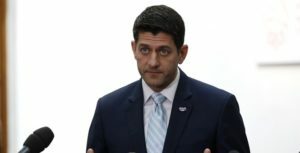 Such inaction is a stain on outgoing Speaker Paul Ryan’s legacy. If incoming Speaker Pelosi does the same, it could ruin her. If Pelosi doesn’t move immediately to disclose the names of those in Congress who used this hush fund, she will be part of the biggest sexual misconduct scandal in history. Nobody knows how many congressman and Senators are involved, and if she is a willing participant to keep all of this a secret she will forfeit credibility on every other issue. Pelosi has been as outspoken as any leader in the Democratic Party, as any feminist leader and as any celebrity when it comes protecting women from male predators. She will now have the power to take meaningful and lasting action but she said nothing about the issue during the last few months of the campaign, and has said nothing about it since the election. Nor have we heard a word from any of the newly elected incoming Democratic freshman congressional class — many of whom are women — since the election. The same goes for the women leaders who plan to seek the Democratic nomination for president in 2020. So far all we’ve heard and seen from congressional leaders in both parties has been lip service about training going forward. The truth is what will actually put a stop to male predators in Congress will be publicizing the names of those for whom the public paid to protect. A woman Speaker, and her party by extension, cannot be part of an old boys club/incumbent protection scandal. A woman Speaker who continues to sweep this scandal under the rug, and her party by extension — the party of which she’s has been a leader for many years — would render themselves a disgrace in the eyes of the American people. A version of this oped was published by USA Today. President Trump should be commended for his nomination of Brett Kavanaugh, an abundantly qualified and impartial judge, to the Supreme Court. 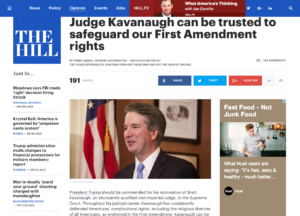 Throughout his judicial career, Kavanaugh has consistently defended Americans’ constitutional rights, including the religious liberties of all Americans, as enshrined in the First Amendment. Kavanaugh can be trusted to continue to protect this fundamental right as a justice on the nation’s highest court. Click here to read the rest of this op-ed as featured on The Hill. Last week, President Trump begrudgingly signed into law a $1.3 trillion omnibus spending bill that runs out in September. The Republican-controlled Congress sent the president a bill that rightfully increases support for the U.S. military but doesn’t offset spending and, thus, increases our national debt by at least $1 trillion. The American public has little appetite for hard decisions. Even the Republican base refuses to have an honest conversation about the long-term sustainability of entitlement spending. At some point, we will be forced to reconcile our list of wants with real needs, and that will be a necessary but painful process. But it’s about to get painful for Republicans immediately. Pro-life Americans elected Donald Trump as president, and he has not disappointed. He has followed through on promises to appoint constitutionalist judges and used every legal tool of his Administration, from personnel to regulations, to side with life. However, he cannot do it alone. Sure, the House of Representatives took up easy-to-pass bills like the Unborn Child Protection Act, which protects children beyond five months gestation. Public opinion is strongly in favor of these commonsense limits. The majority of the Senate agrees but could not reach the 60-vote threshold. However, Congress cannot vote for spending bills paying for abortion and maintain their pro-life credentials. Pro-life voters elected Republicans to protect life, and if they do not, what’s the point? We have voted, rallied, phone banked, gone door to door, and given small contributions to assure that Republicans are elected. So here’s the deal: Concerned Women for America Legislative Action Committee will score against any future spending bills that allow our tax dollars to fund big abortion. We will not support legislators who vote for these bills. Working quietly behind the scenes has failed. At this point, it is better to be feared than loved. We would rather find more pro-life Democrats like Dan Lipinski than continue to be patted on the head and ignored. The gavel is in the hands of supposedly pro-life Republicans, and it is about to be wasted if they can’t make changes with it. The omnibus spending bill was a complete backhand to the pro-life movement. It did not include language for conscience protections for pro-life medical professionals, a repeal of D.C.’s assisted suicide law, a ban on fetal tissue research, or a ban on detainee abortions for DHS. And Republicans again funded Planned Parenthood, the nation’s largest abortion provider, who is on track to receive about half-a-billion dollars per year. How is this possible? Planned Parenthood provides one in every three abortions performed in this nation, over 321,000 per year. The American public overwhelming opposes the entanglement of their money with the taking of innocent human life. Polls show that 60% of Americans oppose tax dollars funding abortion. Planned Parenthood is currently under investigation by the FBI for the buying and selling of body parts of aborted babies, yet their friends in Congress are more willing to fight than pro-life members are willing to stand firm. Our president clearly articulated to Congress that he will not sign another funding bill like the last, and we should believe him. The President has called for an end to the filibuster. That is a strong suggestion but even short of that idea Mitch McConnell should require Senators to literally hold the floor if they wish to stop legislation. House Appropriator Robert Aderholt (R-Alabama) on Alabama radio has called the current system a “phony filibuster” and he is right. The pro-life community can no longer allow Republican lawmakers to get away with bowing to the big abortion lobby. As the leader of the nation’s largest grassroots women’s organization, as a conservative, and as a defender of life, I am embarrassed by the omnibus spending bill. Planned Parenthood supporters in the Senate need to have to explain why they are choosing funding abortion over funding Social Security in a shutdown. This is about light and darkness — life and death. We will stand with life. Editor’s Note: A version of this article was published by Townhall. Click here to read it. Anita Hill is not Hollywood’s answer. Her ‘they all do it’ defense of Clinton doesn’t fly. Besides the obvious problem of Hollywood big wigs choosing to politicize this problem, the deeper issue is that Ms. Hill is not the advocate for whom women are looking, especially in an industry that is led by many clearly hypocritical men. 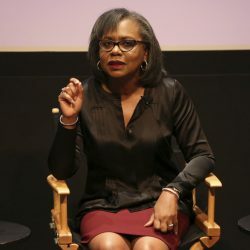 The women of Hollywood may have grown up learning about Anita Hill as a heroine, but as we’ve come – all too painfully – to learn, academia and media have painted a picture of her over the past quarter century that is conveniently divorced from reality. Ms. Hill had the chance to stand up for numerous women who were being sexually mistreated by a powerful man. Instead she chose to defend that man and cast doubt on his accusers. So much for every woman deserving to be believed. During President Bill Clinton’s sexual misconduct scandals, Ms. Hill was interviewed by Tim Russert and Gwen Ifill of NBC News on Meet the Press. They asked her directly about accusations made by Kathleen Willey, Paula Jones, and others. Her reaction would cause a great deal of shock today, and the women of entertainment need to know what she said then, because it affects how much confidence they should invest in her now. Kathleen Willey, once an enthusiastic fundraiser for, and supporter of, Bill Clinton’s successful presidential campaigns, came to see him in the Oval Office. She was in financial trouble. He chose this moment to assault her. When asked about Willey’s accusations on Meet the Press, Ms. Hill dismissed them. She then inexplicably launched into the “they all do it” defense, citing Presidents Kennedy and Johnson among others. If you’re a woman in the entertainment industry – or any victim of sexual misconduct or physical assault – and you’re watching this or reading the transcript, it does not inspire confidence. Quite the opposite, especially in light of the revelations about Harvey Weinstein and others. Hill kept going and even more inexplicably compounded the “they all do it” defense with the now unfathomable double-standard reasoning that President Clinton should get a pass because … he’s a liberal and supports so-called “women’s issues.” Sound familiar? When Ms. Hill had the opportunity to step up and defend the powerless against the most powerful man in the world, her instinct was to defend him, because his politics happened to be liberal. Well, it’ll come as no shock to every woman in Hollywood that their town is replete with countless powerful men whose politics just happen to be liberal. It doesn’t take a great intellectual leap to posit this is why, in all their insecurity (and condescension), the Hollywood moguls picked her to lead the commission in the first place. If these leaders truly care about the women in their industry, they’ll find someone way better to lead this effort than Anita Hill. As it stands, with Anita Hill at the helm, this effort must be viewed as unserious. Editor’s Note: A version of this article was published by USA Today. Click here to read it.